Scientists are studying ways to better manage “high-carbon” ecosystems to address climate change and support livelihoods. As much as 80 percent of that carbon is stored in a submerged layer of peat. New guidelines for calculating carbon emissions from wetlands will provide a more accurate picture of buried treasure — a massive amount of carbon on a scale that is often underestimated and often unnoticed because it is stored underground, experts say. Tropical wetlands, including palm swamps and mangroves, are important carbon sinks, but as much as 80 percent of that carbon is stored in a submerged layer of peat. Because the depth and extent of the peat layer can vary, it is difficult to measure the volume and calculate the amount of carbon stored there. The new guidelines from the U.N.’s Intergovernmental Panel on Climate Change to be presented at the upcoming U.N. climate summit in Warsaw offer improved methodologies that will make it easier for countries to measure wetland carbon fluctuations more accurately, said Daniel Murdiyarso, a principal scientist at the Center for International Forestry Research (CIFOR). Palm swamps, mangroves and peat bogs throughout the tropics are disappearing rapidly as they are drained for fish farming, agriculture and infrastructure development. Recognizing their value could provide an incentive for conservation. Part of the problem is that a swampy area studded with palm trees may not appear as though it would store much carbon, but its water-covered surface conceals a layer of peat. Peatlands and other wetlands, such as coastal mangrove swamps, are considered “high-carbon” ecosystems. Worldwide, tropical mangroves store 20 billion metric tons of carbon (measured in petagrams of carbon, or PgC); tropical peatlands store 89 PgC, according to a paper co-authored by Murdiyarso and published in October in the journal “Carbon Management”. About three-fourths of those wetlands are in Southeast Asia, with 11 percent in South America, 9 percent in Africa, 3 percent in Central America and the Caribbean, and small amounts in other Asian countries and Pacific island nations. Because peatlands have a high carbon storage capacity, conserving and restoring them can help mitigate the impact of climate change, Murdiyarso said. 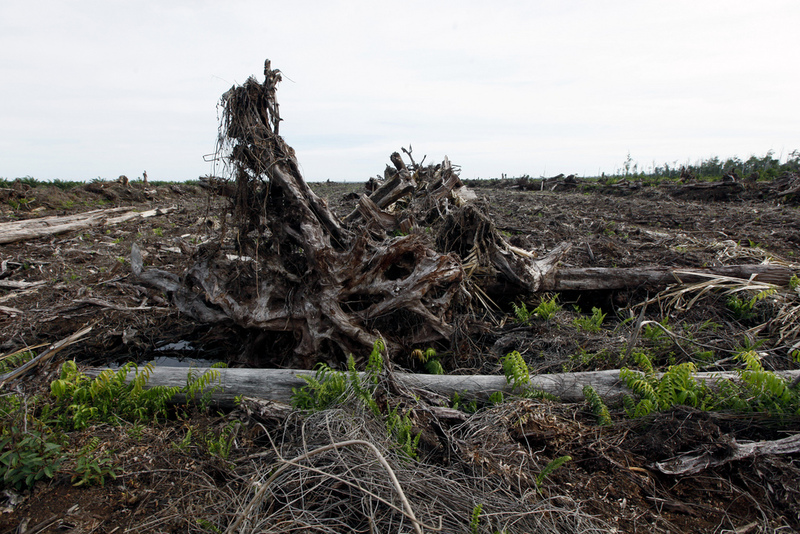 But many wetlands are being destroyed or degraded because their rich soil and their location in flat tropical lowlands or along coasts make them attractive for industrial operations such as aquaculture and oil palm or timber plantations. When the peat is dug up or burned to make way for other uses, carbon is released, contributing to high greenhouse gas emissions. Fires set to clear peatlands for timber or oil palm plantations in Indonesia produce a smoky haze that in the case of Indonesia can spread to other countries. Most countries lack accurate assessments of their peatlands that would enable them to quantify carbon storage or greenhouse gas emissions. Measurement is particularly difficult because the peat layer is underground and underwater, and the thickness may vary from place to place in the same area, Murdiyarso said. The new guidelines approved by the Intergovernmental Panel on Climate Change offer more precise methods for calculating carbon storage and emission factors — the average emission rates of a particular greenhouse gas from a given source — in peatlands, wetlands, marshes and sea grass. More accurate calculations would enable countries to include peatlands, mangroves and other wetlands in carbon financing programs, but carbon credits alone may not provide sufficient incentive to conserve wetlands, because agricultural or industrial uses are more profitable in the short term, Murdiyarso said. When combined with other ecosystem services, however, the value of the stored carbon could provide an incentive for countries to conserve wetlands or convert them to low-emission uses, he said. Wetlands also offer opportunities to combine climate adaptation and mitigation strategies. Through CIFOR’s Sustainable Wetlands Adaptation and Mitigation Program (SWAMP), scientists are studying ways to better manage wetlands to address climate change and help local residents maintain their livelihoods. For example, conserving palm swamps in tropical forest not only mitigates climate change by storing carbon and avoiding greenhouse gas emissions, but it also provides local people with fruit for their families or for sale, Murdiyarso said. Along tropical coasts, the sediment that accumulates in mangrove swamps provides protection against climate-related sea-level rise. At the same time, the mangroves provide a spawning ground for fish and habitat for some mollusks that are important food and market items for local residents. The new guidelines are a step toward calculating those figures, and Murdiyarso hopes the U.N. climate conference in Warsaw will make countries more aware of the value of their peatlands, mangroves and other carbon-rich wetlands. This work forms part of the CGIAR Research Program on Forests, Trees and Agroforestry and is supported by USAID, NORAD and AUZAID Agency for International Development, Norwegian Agency for Development Cooperation and AusAID.